Excellent performance- including superior cold hardiness and incredibly floriferous is why we grow this moderately large spreading Rockrose. Grass green linear foliage in dense and always fresh on an upright and spreading shrub. 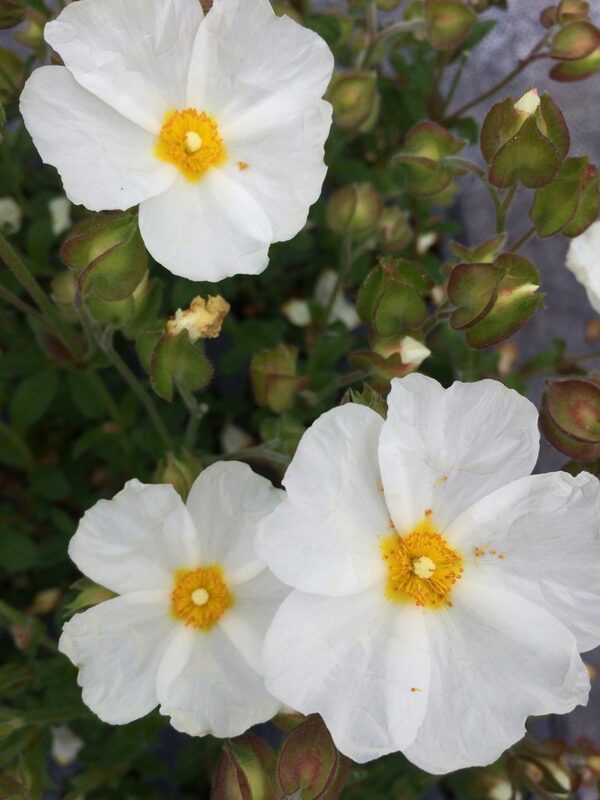 Grows in tiers which is pretty and displays the copious single white flowers well. Flowers appear daily from May to July. To 3′ x 5′ and low and spreading initially then lifting itself up gradually. Excellent cold hardiness. We’ve tried many, many Cistus planted out at our Wholesale Nursery site in Wilsonville- at least one zone colder than the city of Portland. This carefree shrub has sailed through 5ºF multiple times with NO DAMAGE and thrives in clay soil on a hillside with absolutely no summer water. As with all Cistus avoid overly enriched soil and too much summer water. Neglect is this tough shrubs friend. Moderate deer resistance. This is confused in the trade and may also show up from time to time as ‘White Gem’- its not.